It is clear this determinant is one of the best investments our community can make, yet it remains significantly underfunded. Calls attention to the early care and education programs needed to serve our young children and how we can increase access to these programs. Describes challenges facing educators and highlights private and public strategies to strengthen the workforce and improve outcomes for children. Calls attention to how experiences shape brain development and outlines our opportunity to support parents and caregivers at this critical time for young children. We must also acknowledge that early brain development begins before a child is born. Having reviewed a number of compelling studies, the Task Force was so struck by the power of this determinant, we stepped up early to support the commitment of the Charlotte Executive Leadership Council (CELC) to fund a major study on this subject. In late 2016, a study group of community leaders began considering a range of options, including universal access to high quality early childhood education and the costs for implementation. Under the leadership of Mecklenburg County, this study will develop a comprehensive roadmap for wider access to quality early childhood education in our community. We believe any program selected for trial or implementation must be given sufficient funding and the opportunity to demonstrate impact, so that Charlotte may experience the same levels of improvement documented in other longitudinal studies. The Task Force noted reading proficiency as a related factor. Children who enter kindergarten at a deficit can be half as likely to read proficiently by third grade. In turn, children who are not reading well by third grade are four times more likely to drop out of high school. 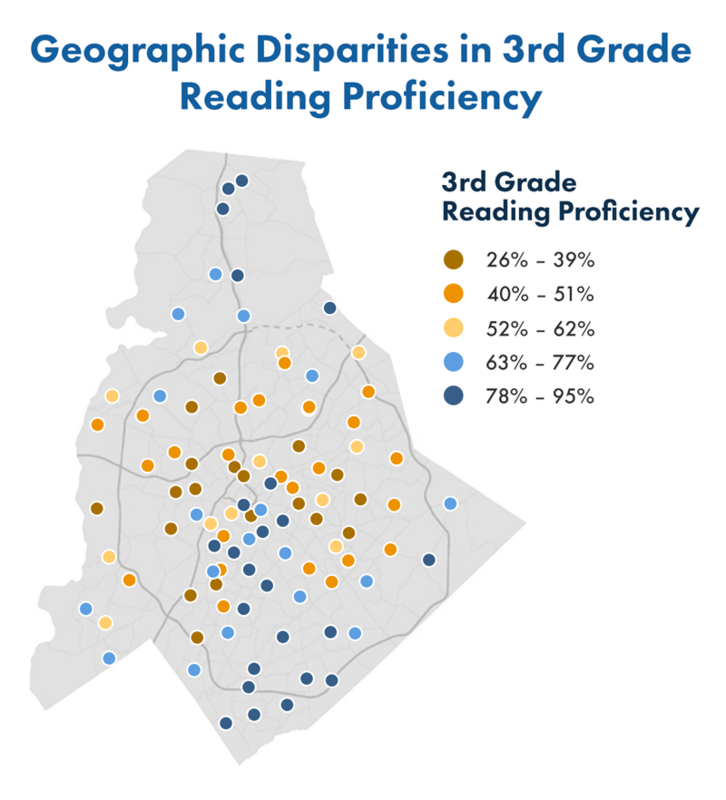 Only 39 percent of Charlotte-Mecklenburg’s third graders were reading at grade level in 2014. Because third-grade reading proficiency is such a critical indicator along the path to high school graduation and beyond, private philanthropy coalesced to launch Read Charlotte in 2015, an initiative aimed at doubling third grade reading proficiency to 80 percent by 2025. The Task Force strongly supports the work of Read Charlotte and sees it as an important intervention for economic opportunity. In fact, Read Charlotte’s systems-based approach could serve as a model for the implementation of this report. Furthermore, the issue of literacy is one that impacts all children in our community and is an example that illustrates the focus of this report. Work remains to be done for all children and youth, regardless of geography, race, gender, and ethnicity. This deficit in reading proficiency highlights the need for every community member and every neighborhood to embrace the work of the Task Force. To reach Read Charlotte’s 2025 goal, the advancement of literacy hinges, in part, on the preparedness of children before they enter kindergarten. Accordingly, quality child care and public pre-kindergarten education become important interventions for children. 55,814 children ages birth to four; of these, 24,558 children (44%) live in households earning below 200% of the Federal Poverty Level. 13,976 children ages four to five; of these, 6,149 children (44%) live in households earning below 200% of the Federal Poverty Level. The average annual fee charged for providing full-time child care in Charlotte-Mecklenburg is $11,440 for an infant and $10,088 for four-and five-year-olds.xiii These fees challenge most families with young children and are absolutely cost-prohibitive for low-income working families, thereby limiting parental employment and access to child care without child care financial aid. In the absence of financial assistance, many parents resort to patching together child care for their children from family, friends and lower cost, unregulated providers. Funding for an additional 9,289 spaces would be needed to ensure all four-year-olds in Mecklenburg County (excluding those four-year-olds currently enrolled in child care with subsidy or already participating in public pre-K) have access to public pre-K.
Funding for an additional 3,151 spaces would be needed to ensure all four-year-olds in Mecklenburg County living in households earning less than 200% of FPL have access to public pre-K.
Funding for child care financial aid for an additional 2,617 birth to four-year-old children is needed to ensure children in this age group who are currently on the county’s child care subsidy waiting list have access to child care. If we include children ages birth to five on the waiting list, the total is 3,014 children. For these and other recommendations in this report, costs and funding sources will need to be identified and discussed. However, due to the complexity of addressing those concerns, including the opportunity for new funding or redirecting current investments, public sector vs. private sector, the role of philanthropy, etc., we have not provided direction for how to pay for the recommendations in our report. For example, we know a quarter cent sales tax increase can generate $20 to $30 million annually, but deeper understanding of such an increase is needed to make a firm recommendation. The consultant study underway and funded by the CELC will identify costs associated with and recommend funding strategies to implement the options above. Another issue we must pay attention to is that Latinos now comprise a little over 13 percent of our population; however, we are seeing a relatively small number of Latino children accessing licensed early child care and private pre-schools. Latino children are more likely to be cared for by family or friends. We need to do a better job of engaging Latino parents whose children may be missing out on opportunities to adequately prepare for success in kindergarten and beyond. We need to better understand barriers—perceived and real—that limit enrollment of Latino children in licensed care and/or preschool. We also need to ensure that early educators have the skills and resources to meet their cultural and linguistic needs. Make the necessary investments to ensure all children in Mecklenburg County from birth to age five have access to quality early care and education. Eliminate the waitlist for subsidized child care for all children birth to age five (3,014 children). Make high-quality voluntary public pre-k universally accessible to all four-year-old children. Increase access to voluntary high quality early care and education starting at birth, for all children starting at birth, regardless of family income following attainment #1 and #2. Promote a clear definition of and related indicators for what “ready for school” means across multiple dimensions to ensure early educators and families share common readiness expectations for children. Improve data collection and reporting on school readiness. Provide expanded support of Read Charlotte and ensure necessary resources are available to implement identified strategies. Increase enrollment of young Latino children in quality child care and public and private pre-k education programs. Promote greater racial integration of our early care and pre-k programs to start building interracial relationships and trust from an early age. Complete a financial evaluation of options to expand access to early education in Mecklenburg County. This study is funded by the Charlotte Executive Leadership Council (CELC), and spearheaded by Mecklenburg County, with findings anticipated in 2017. Explore the possibility of utilizing a local sales tax increase to expand early childhood education. Complete and implement findings from Mecklenburg County’s Feasibility Study of Pay For Success as a financing mechanism to enhance and expand access to Pre-K for four-year-olds. The study is funded by the Department of Education with results anticipated in 2017/early 2018. Develop and execute a comprehensive funding strategy to provide greater access to quality early child care for children ages birth to four and public pre-K for four-year-olds based on the two studies above. Quantify the costs and consequences to the community if greater access is not provided. Advocate for increased funding and reimbursement rates for child care and public pre-k at the federal and state level. Advocate for increased funding of public Pre-K at the federal, state and, particularly the county level. Identify and convene Latino community leaders to identify access barriers and to inform strategies to increase Latino family awareness about the importance of early learning within and beyond the home. As we look at the issue of child care, it is imperative we maintain an emphasis on the quality of each child’s experience. Demanding high quality care can be challenging when the average hourly wage of a child care teacher is $11 an hour and $8 an hour for assistant teachers. Turnover is understandably high in the field, with nearly a quarter of full-time child care teachers and assistants leaving their centers in the last year. Importantly, many child care workers are parents themselves, trying to make ends meet and support children of their own. In the face of low wages, close to a third of these workers receive some type of public assistance. Just as an investment in early care and education will strengthen our future workforce and create a firm foundation for a prosperous Charlotte-Mecklenburg, an investment in the professionals who care for and educate our youngest children will strengthen and improve the quality of early care and educational programs available. Just as an investment in early care and education will strengthen our future workforce and create a firm foundation for a prosperous Charlotte-Mecklenburg, an investment in the professionals who care for and educate our youngest children will strengthen and improve the quality of early care and educational programs available. As we move forward, we must focus on compensation, education, and professional development of our early care and education workforce. The job of educating our next generation of leaders, creators and innovators must be understood and supported as a noble profession. Furthermore, Charlotte-Mecklenburg must embrace and support the blossoming diversity of our community by increasing the cultural competencies and linguistic diversity of our early childhood workforce to better serve children and families of all backgrounds, races, and ethnicities. When comparing the enrollment of African American and white children in early licensed child care to the enrollment of Latino children, Latinos are underrepresented. In part, this may be due to the lack of Latino early childhood educators in these programs. Latino families may be less likely to enroll their children in programs where they do not see people who look like them or speak Spanish. Accordingly, recruitment and training of Latino professionals become a pathway to greater enrollment by Latino children. Cultural proficiency needs to be part of professional development for all early care and education teachers in order to serve an increasingly diverse enrollment. Strengthen the early care and education workforce to improve the quality and experiences of early care and education available to children ages birth to five. Improve the compensation and benefits of early care and education providers. Expand the number of early care and education providers with certifications, credentials, and degrees. Increase access to ongoing professional development for early care and education providers that is responsive to their limited time and financial resources, as well as to their educational needs. Grow the cultural and linguistic diversity of our early care and education workforce to better serve our Latino children and families. Determine the cost of raising our child care workforce’s compensation to that of comparably educated staff in public Pre-K, Head Start, and Early Head Start to reduce turnover in the early care and education workforce. Investigate public and private strategies that have increased the early care and education workforce’s compensation without increasing costs of care for families. Pursue strategies to increase our early care and education workforce’s access to and engagement in pre-service, in-service, continuing and higher education, and peer learning. Increase access to classroom and program-based consultation, coaching, and mentoring available to early care and education teachers/providers to reinforce use of evidence-based early brain development and literacy practices. Train all early educators in “ready-for-school” indicators. Engage with community organizations and houses of faith that serve our Latino population to increase awareness of the need for Latino early educators and promote the profession. Create targeted recruitment strategies and supports for Latinos interested in entering the field, including having more bilingual early childhood educators. Expand recruitment and support for CPCC’s integrated pathway that targets ESL students and combines ESL instruction with the course needed to pass the early childhood certification exam. Parents, guardians, and caregivers play crucial roles as a child’s first teachers in promoting positive early brain development, social and emotional health, and early literacy. Beyond the home, engagement in high quality child care and other early learning programs enrich the early experiences of young children during a critical window when the brain is developing at an unparalleled rate. Sound “brain architecture” lays the foundation for later emotional, physical, intellectual and social development. This foundation begins before a child is born and is affected by a mother’s prenatal care. After birth, healthy emotional experiences play a central role in building this architecture, 90 percent of which is developed by age five. Stress can undermine this process in children. Children in poverty, who may suffer prolonged periods of instability, often experience toxic stress, leaving them vulnerable to physical and mental illness later in life. The reliability of quality early care and education and other early learning programs in early life would provide some respite from uncertainty. Parents and families should be engaged as partners and leaders in co-creating and implementing solutions to improve their children’s social-emotional competency, language, and literacy development. One impactful way to do this is by building the capacity of child care and public pre-K programs, schools and providers to effectively engage families in a meaningful way. By providing parents with supports such as no-cost book services, access to adult education and support groups, we establish solid foundations on which early care and education providers can build. It is equally important that we provide parents with greater access to developmental screenings for their children to help them identify learning delays, vision problems and other issues that may affect school readiness and to enable them to seek help sooner than later. Helping parents offset the cost of early care and education enables them to shift more resources to support services outside the early care and education setting. Access to such resources can help reduce anxiety for both families and children. Support parents and other caregivers as a child’s first teacher in promoting positive early brain development, social and emotional health, and early literacy beginning at birth. Educate parents, early educators, and other caregivers on the importance of positive early brain development, social-emotional development, and early literacy and provide training on how to best support and interact with their children from an early age. Promote families as partners and leaders in co-creating and implementing solutions to improve a child’s social-emotional and language and literacy development. Build the capacity of early child care and early learning programs to effectively engage families in meaningful ways to support their children’s social-emotional, language, and literacy skills. Leverage support from others in the community to promote early brain and social-emotional development and early literacy skills through their unique connections to parents and children. Provide parents with greater access to developmental screenings for their children to identify learning delays, vision problems, and other issues that may be affecting school readiness and that will enable them to seek help sooner than later. Develop and launch a public campaign to promote positive early brain development and early literacy. Explore piloting a model community-based family resource center concept that uses a “whole child” approach in helping children and parents address the multiple variables that impact a child’s readiness for kindergarten. Help parents develop networks of peer and other support within their neighborhoods and communities create more mutual support for effective nurturing, early literacy, and advocacy for their children. Expand access to evidence-based programs such as “Raising A Reader” in child care centers, family child care and homes, pre-schools and faith-based preschools, and other community settings. Encourage more employers to provide paid maternity leave and utilize other employment practices that enable parents to better support their children’s early development. Increase the number of medical practices and clinics serving children and young mothers who are participating in the “Reach Out and Read” program that encourages active reading with children ages 0-3. Embed more early learning skills in brain building activities provided through cultural and educational institutions. Increase access to post-screening developmental supportive services for children. Provide support for integrated family literacy programs at CMS elementary schools for parents and caregivers that integrate English language instruction and basic skills development with awareness of early brain development, social and emotional development, and skills needed to help parents support their child’s education.